The announcement that the Victoria Hotel was introducing a Tuesday curry night claimed our attention. And to be honest, we’re not sure why – with so many very affordable and often excellent curry options close to the refurbished pub (43 Victoria Street, phone 8320 0315). Nat and I surmised that it might have been because we had such a fine time during our initial visit to the Middle Footscray establishment. That visit’s favourable impression having since been reinforced by favourable feedback from friends and readers who had visited the place. As well, based again on our enjoyment of the food previously, maybe the pub’s curry operation – hopefully – would provide something above and beyond the offerings of the local curry shops. Whatever – we’re up for it! So how do we go? 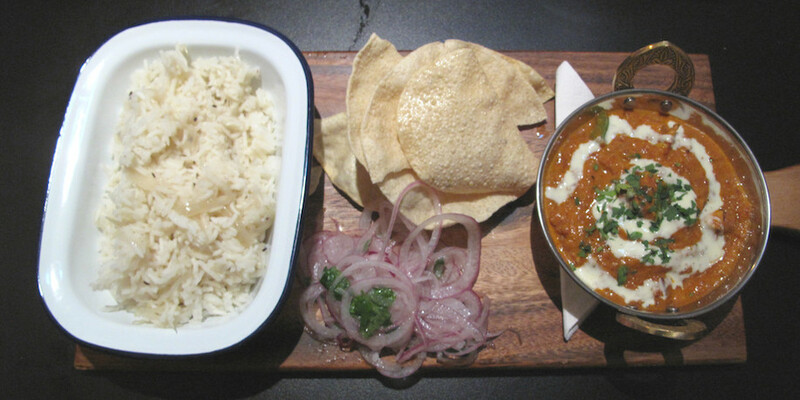 We’re offered two curry packages – paneer and peas makhani or kadai chicken. The curry meal deals cost $18 and come with a good-size bowl of chicken curry, rice, a fistful of papadums and red onion slaw. Kadai, also known as karahi, is a simple curry made with many of the expected spices and capsicum. Ours is mild and quite tangy. We like that the boneless chicken has seemingly been chargrilled before being wed to the gravy. The rice and papadums are fine. We have been looking forward to an alternative to the frequently served (elsewhere) hard nobs of commercial mango pickle. Our red onion mix is OK, but I would’ve loved a bit more tartness and zing. Putting aside the likes of dosas, biryanis and thalis, if you ordered the components of our meal for dinner just about anywhere in West Footscray, it’d cost the same $18 or more. An “announcement” eh? Traditional boozers, which this place now is definitely not despite their publicity machine having been in full flight, rely on word of mouth to get their message across but I digress unnecessarily. What I really can’t understand is why anyone in the inner west would bother going to a pub for a curry when the subcontinental eating scene is saturated like no other recently arrived (last 3 decades) cuisine has ever achieved?? My experience in both city areas and country locations is that one ought to avoid Asian inspired dishes in pubs and clubs alike. Indeed there is a good case to be made that one should approach any Asian cuisine anywhere with caution if it is not within a recognised locale where such cuisine has garnered a well deserved reputation, ie Chinese in Chinatown, Vietnamese in Footscray, Sunshine etc, Turkish in Sydney Rd., just to mention a few examples. I’m open to other opinions on the subject. Hi Pablo! As I say in the story, I agree with you mostly. We gave it a shot anyway – and enjoyed it. Would we do it again? Probably not. We were part of a quite big group and not all ordered the curry deals. And, TBH, the chicken parmas look really bloody good. As far as word of mouth goes, this pub has mostly been going about its business rather anonymously – notwithstanding some early stories generated by the protagonists’ credentials. I think they only got a Facebook page going quite recently. Speaking of which, from what I can see, “word of mouth” these days in the inner west – mileage may vary in other locales – is most certainly a lot about Facebook. And maybe Twitter – I don’t know. My FB feed is about a third inner-west food outlets of various kinds. An endless parade of enticing specials. And, yes, we regularly make eating decisions based on them.